There’s a new name in wine coolers: Avallon. An obvious attention to detail suggests that these coolers deserve more than just a second glance. Let’s take a moment to focus on Avallon’s genesis line and see what sets these built-in wine coolers apart from all of the rest. This feature may seem trivial but a quick comparison with the alternative proves that it is not. The aesthetic difference between a 4-piece door frame and a 1-piece door frame is striking and very noticeable in person. Seamless is also the better option in terms of durability. Because the frame is made from 1 solid piece of stainless steel, the likelihood that it will break, jut out in various corners, or other common frame issues is decreased significantly. Shelving can make or break a wine cooler experience. If you have trouble accessing the wine in your cooler, many frustrations will ensue. Avallon seemed to have realized this when they equipped their wine coolers with roll-out shelving. This feature allows you to pull out and push in the shelves effortlessly. This also allows you to pull the shelves out all of the way without fear of it falling out, giving you a clear view of the bottles you’ve placed there. It is no secret that heat, UV rays, and harsh lighting are all enemies of proper wine storage. Avallon’s glass design has made it obvious that they are acutely aware of this fact. 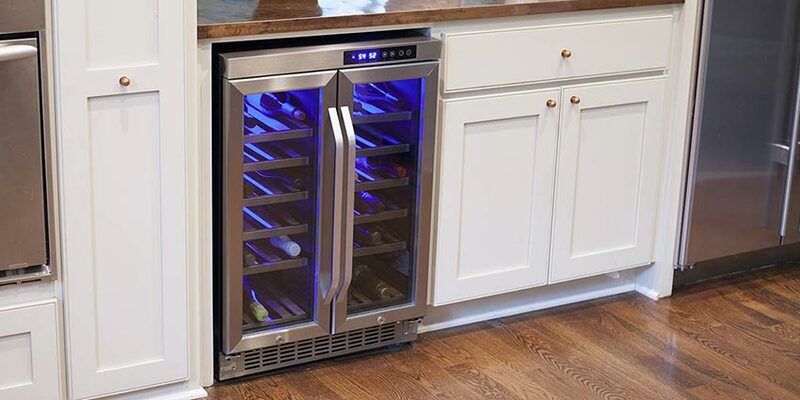 Low-E, also known as Low Emissivity, glass doors are a top-of-the-line wine refrigerator feature. These doors absorb very little thermal energy (heat) and reflect most thermal energy that comes into contact with it. Beyond that, Avallon’s glass is also dual paned and filled with argon between the panes. Argon is a gas that, when used in between window panes, minimizes the amount of heat that passes through the glass and prevents the glass from frosting up. It acts as an insulator, keeping cold air in and warm air out. Argon gas also helps to block UV rays. Avallon wine coolers use forced air circulation fans in conjunction with their compressors. This ensures that the cold air is distributed evenly throughout the interior, eliminating possible hot spots. Cold plate cooling methods and thermoelectric cooling cannot compare to the reliability and evenness of this air cooled compressor cooling. Also, although their wine coolers use a compressor, Avallon was sure to employ a vibration-absorbing casing around it, greatly limiting the amount of disturbance felt by your wine. 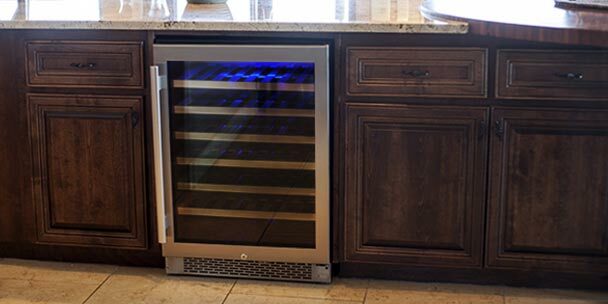 Avallon’s built-in wine coolers come in two widths and are available in single and dual zone designs. If you’re looking to replace that outdated trash compactor or other slim undercounter appliance, a 15 inch unit is what you want. 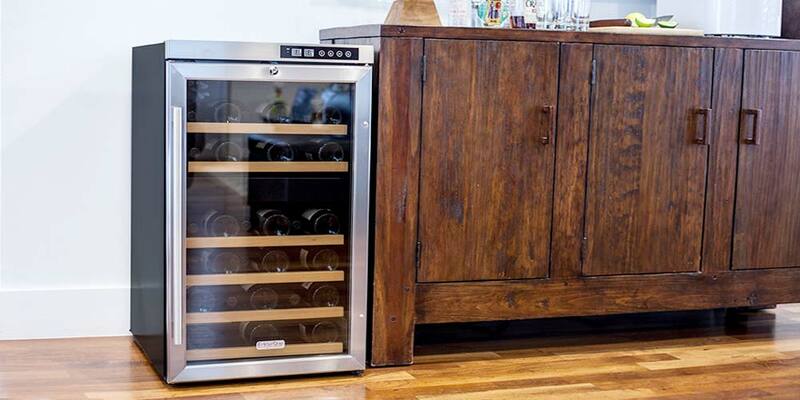 The Avallon 30 Bottle Built-In is a single zone wine cooler with all of the bells and whistles. It fits 30 standard Bordeaux style bottles and has a wide temperature range of 40-65°F, making it an ideal option for either red or white wines. 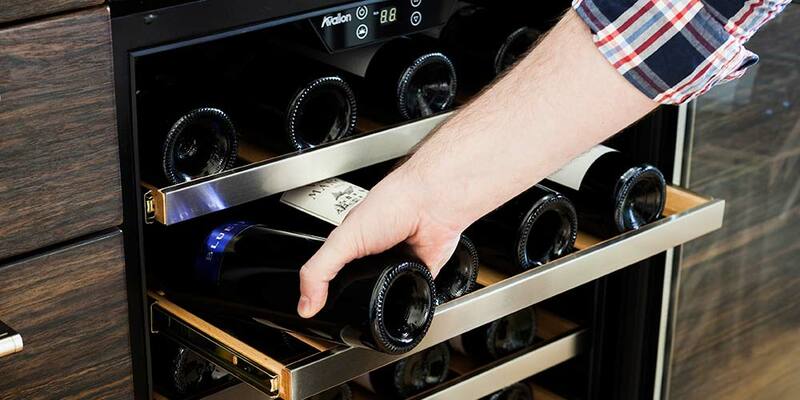 It’s dual zone cousin, the Avallon 28 Bottle Built-In has 2, independently controlled temperature zones, making it the perfect option for storing both red and white wines, each at different temperatures. If you’re looking for more storage than what a 15 inch wine cooler can provide, you’ll want to consider a 30 inch. 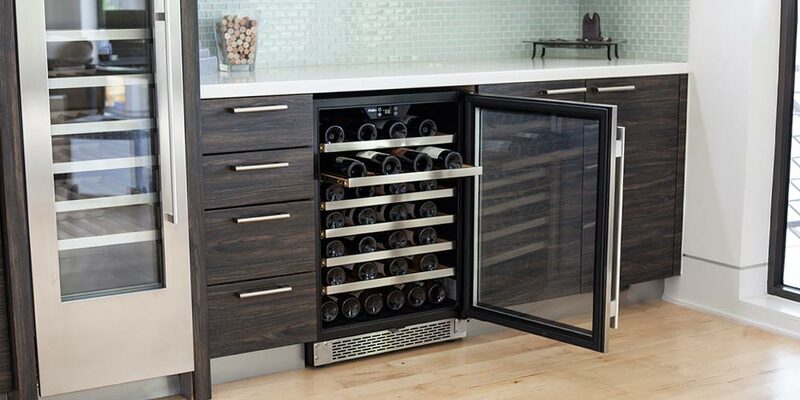 The Avallon 54 Bottle Built-In is a single zone unit with lots of bottle storage. You’ll be able to house your collection with room to grow. Soft touch controls and a digital display allow you to set the unit to a perfect storage temperature. It’s dual zone counterpart, the Avallon 46 Bottle Built-In allows you to store your growing and varied collection with ease. Although they are close, Avallon’s wine coolers are not entirely perfect. According to a few initial customer reviews, there are some areas they could improve. The main critique has been directed towards the spacing between shelves, which is described as being on the snug side. When I spoke to an Avallon rep, though, they explained that a shelf redesign is already in the works. Another customer stated that the soft touch controls were a tad finicky. They found themselves pushing too hard for the unit to respond. 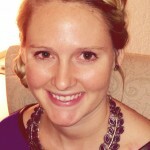 It took them some trial and error to find that a slighter, softer touch warranted better results. With any new venture, of course, there will be some growing pains, but our initial reactions to Avallon’s wine coolers are overwhelmingly positive. If you’re looking for something on the higher end of the scale with an evident attention to detail, be sure to give Avallon more than just a second glance.